Feel free to use this Home Program to hone the ‘Four Core Skills’ (First Touch, 1 v 1’s, Striking the Ball and Running with the Ball). Challenge yourself, the program allows for you to record your times and scores online so that coaches can monitor your improvement. For each playing position there are two training practices, one which requires a server and one which can be done totally by yourself. Use some markers, a few balls, a stop watch and get cracking. Practice as often or only submit scores once a week (The more you practice the better and faster you’re technical abilities will improve). 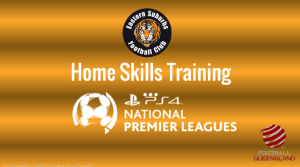 There is a pre-requisite for PS4NPL trialist’s to submit at least two entries prior to attending trials.